Giving up the comfort and security provided by the familiar pacifier is pretty difficult. This free book and stickers will help you think about how to break the pacifier habit. The 15-day stop plan has been carefully put together with a story and an activity or game for every day. 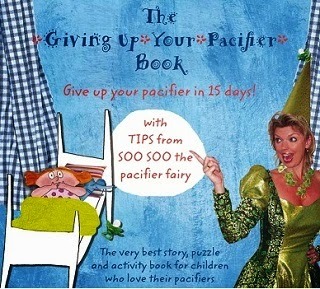 Along the way, Soo Soo the pacifier fairy offers tips for parents and the programme is clearly explained. A pediatric dentist and a speech therapist were consulted in the making of this book. The book offers sensible advice, is educational, and is a pleasure to use for both parent and child. On day 15, the last pacifier can be sent off to Soo Soo the pacifier fairy and Pacifier Mouse, the substitute comforter (who also plays a role in the story), will be sent to your child.